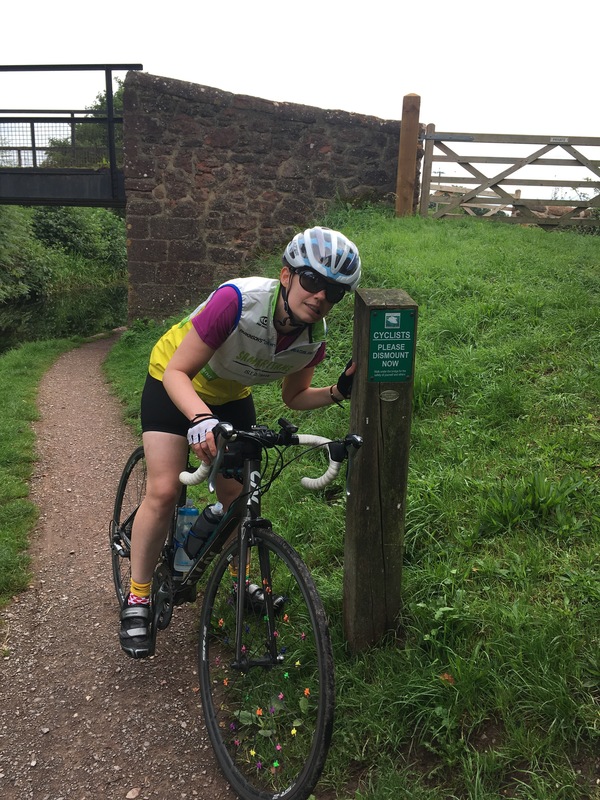 To leave Tiverton all we had to do was follow the route 3 cycle path signs. Sounds simple. But turns out you need more than Liz’s PhD to be able to crack the maze. After turning round several times and nearly getting run over we found ourselves on the Grand Western Canal path, the favoured walking spot for many dog walkers, most with two handfuls of dogs. For a while the canal path made for enjoyable, if a bit slow, cycling. The locks, quaint bridges and moored canal boats were all great to look at. I was even happy to give the wasp that stung me the benefit of the doubt. Unfortunately the path turned into an angry bone rattling monster, then a narrow muddy gauntlet with grassy sides leering at us, and then back to the bone rattler. We first realised we were in Somerset when we saw a road maintenance sign with the council’s name on. Other clues were the recycling bins outside people’s homes. But we are yet to see a sign welcoming us to the county. Our first stop was Taunton, which turned out to be problematic for support driver one (Jean). We got a text from her telling us she was lost while we (well I) stopped to take a picture of the Frog Street sign. She ended up being escorted to our allotted meeting point by a highway maintenance man that took pity on her. We had been excited about getting to Cheddar. Our opinion was somewhat marred by the garage we stopped at on a very busy junction. A very angry man-woman (really not sure which) had a go at us, for existing I think. But our cycle to Clevedon was more enjoyable. Our route was on The Strawberry Line, a disused railway line that made for speedy, flat cycling on a smoothish surface. 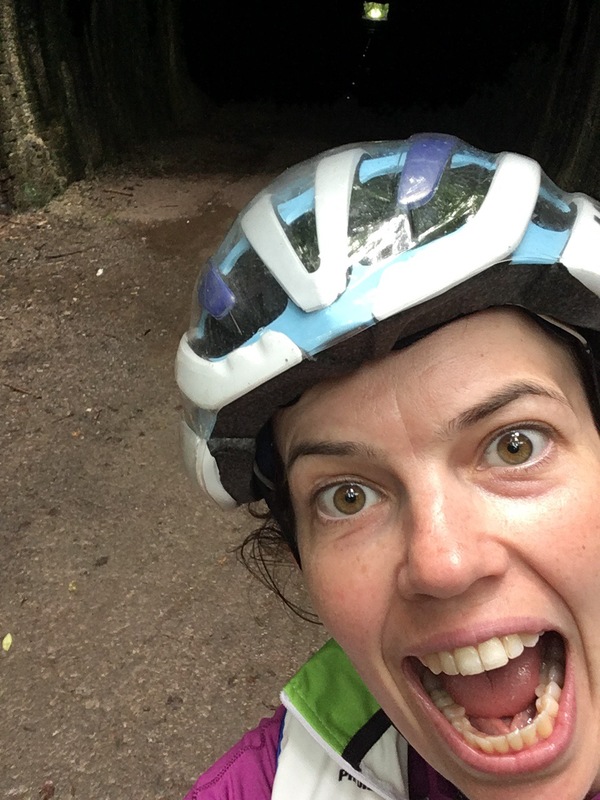 We even got to pretend to be a train cycling through the Shute Shelve Tunnel – very dark! We arrived at our caravan park, yes caravan park, at our earliest time yet, 5.25pm. Me to mum: what’s it like? Mum: ‘It’s fine! (Not looking convinced). I never got to find out how the shower is because I’ve broken it! Support driver two (Liz’s mum Jane) has now arrived to take over from Jean. My mum is now heading off to Spain for a well-deserved break. It had been firmly imprinted on all of our minds for some time that today would be a tough one. With 5,115ft of climbing over just under 81 miles it is one of our hilliest days. With that in mind, we persuaded the surly hotel owner to start breakfast earlier for us and set the alarms for 7am so we could make a speedy getaway. And so it was that Chris led the team off across the hotel’s gravel drive, watched by support driver one (Jean) and another hotel guest…and promptly toppled over! After making sure he was ok, we then set off properly, heading back down the steep hill we struggled up yesterday and on to The Camel Trail. Overnight rain meant it was a mud bath and ourselves and the bikes quickly became caked in mud. Chris surprised everyone by running off across the moor but didn’t go far before realising he should probably be conserving his energy. 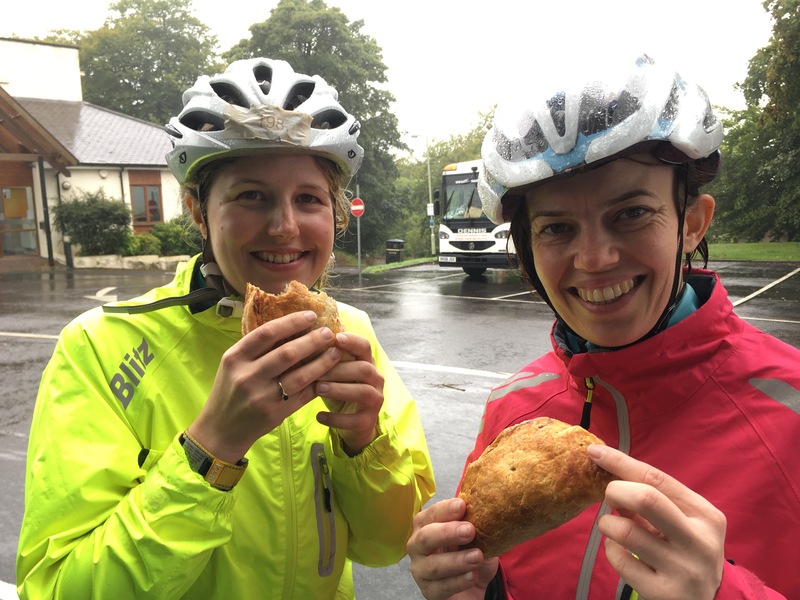 Our lunch stop in Holsworthy was a fairly miserable affair despite the large steak Cornish pasties our support driver had bought for us. We were too wet and muddy to sit in the support car so ate them quickly in the car park in the rain. But we did all feel better after changing at least some of our clothes for the afternoon. We set off again and were excited to see a sign telling us we were now in Devon. We stopped off in the village of Hatherleigh for a tea and coffee and the friendly welcome of the shopkeeper really lifted our spirits. It was just as well as we then set off up and down and up and down Devon’s rolling hills. We were keen to press on but did stop to take pictures of some great place names – Puddington, Three Hammers and Black Dog were some of our favourites. 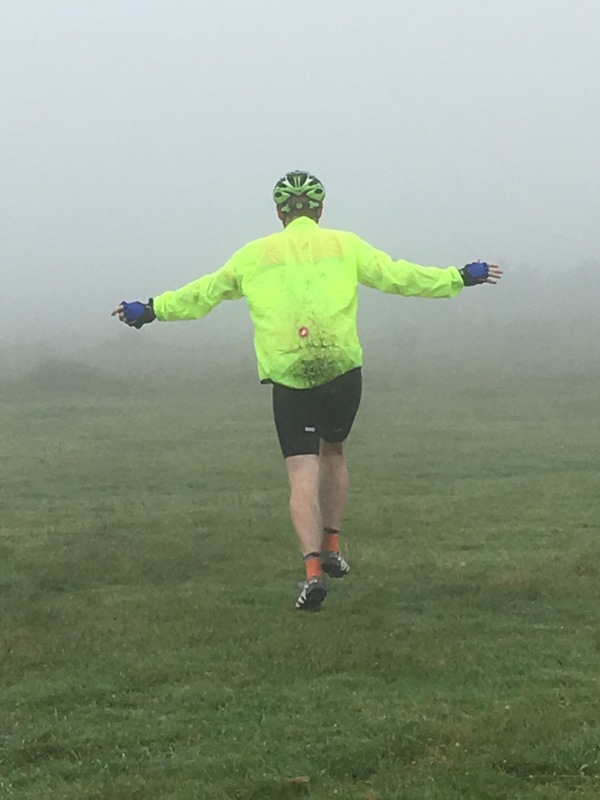 With fives miles to go to Tiverton thoughts had turned to a hot shower and dry clothes. But there were two long drags in our way which sapped our remaining energy. Our guest house is kindly washing our clothes and let us use the hose so we could give the bikes a good clean. But it did take a long time to scrub off the mud. 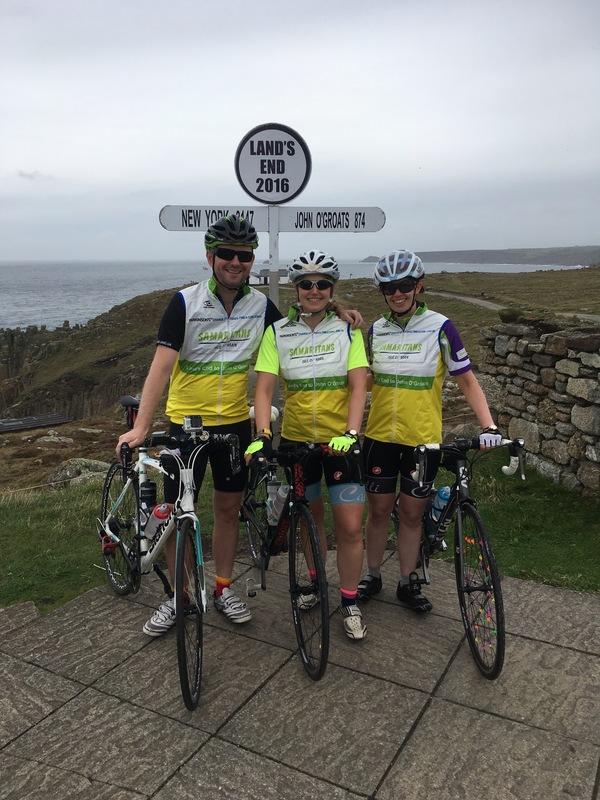 We arrived at Land’s End to find we certainly weren’t the only End to End cyclists setting off today. After waiting for a large group to have their pictures taken we lined up in front of the signpost for the obligatory photo taken by support driver one, Jean. Land’s End itself was rather strange – a random collection of tat collectively comprising a visitor centre. And then we set off back towards Penzance. Cycling along the seafront Liz tried to take us into the harbour for a second time. And we soon discovered the directions on the Garmin and Liz’s sense of left and right have room for improvement. By the end of the day, Liz was adding ‘actual’ before the direction. We think it meant she had thought about it before speaking. The road surface varied significantly. The best were quiet lanes. But we also tackled cobbles, sandy paths and puddle filled pothole bridle paths. A few times we had to deviate from the planned route because it looked like a guaranteed puncture. 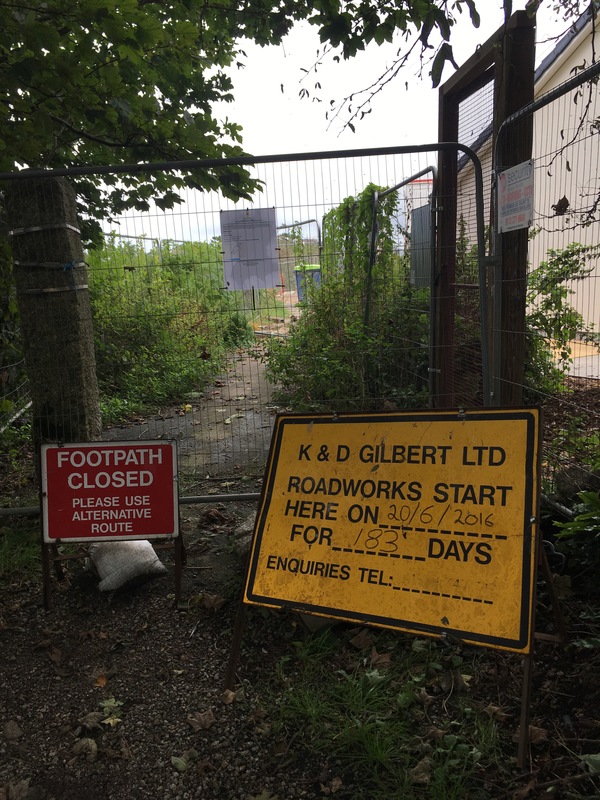 We also had to turn round after climbing a hill to find a housing estate is being built on our cycle path. On the whole we didn’t encounter too much traffic but there were a few busy roads to cross. It wasn’t until after lunch that we encountered the infamous Cornish hills – usually they appeared out of nowhere and continued round many corners. They definitely slowed us down a bit. We took it in turns to ride five miles at the front all day. When we reached The Camel Trail I was in front so took on the role of head camel. Chris was hump one and Liz was hump two. Liz swears she saw four camels. After a surprisingly steep hill into Hellandbridge we eventually arrived at our hotel at 6pm, a bit later than expected. We are now refuelling for tomorrow, which promises to be a longer, hillier route than today. We are all hoping we don’t have too many bonus miles from the dodgy directions! Support driver one (Jean) and I (Jackie) had an early start to fly to Gloucester. Quite a bumpy flight through the mist on a 20 seater tin bucket of a plane so we were pleased to land! Meanwhile it was the start of Chris’s epic 320 mile drive via the airport to Penzance. Liz provided some helpful, some less helpful, travel directions from the passenger seat. Trying to send us into the harbour at Penzance was a low point. I’d like to say it was a scenic drive that whet our appetites for the cycle back north again. Unfortunately we could barely see anything due to the heavy rain and mist. We finally got to our youth hostel at about 5.30pm, about two hours later than expected. 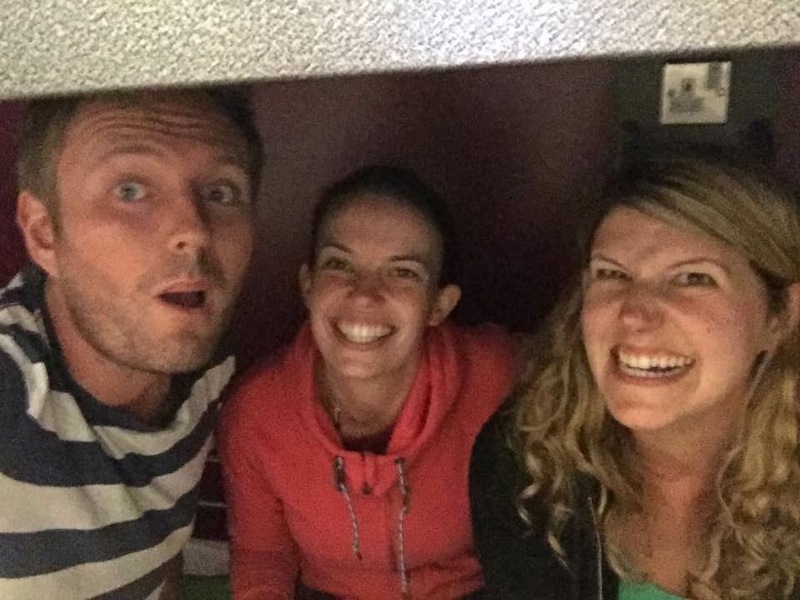 We have bunk beds in tiny rooms – one so small the receptionist gave us free breakfast! Still, we are all quite tired so hopefully we will sleep okay. Dinner was at the Pirate Inn. Decor was a little plainer than we had hoped. But there were some crusty seadogs propping up the bar. Pork pies are going to feature prominently over the next two weeks. Liz is obsessed. So we are going to keep count. So far, one! Our bags are pretty much packed, we’ve spent the week eating pasta, and now there’s nothing left to do but worry whether we’ve done enough training for what lies ahead. It wasn’t until the evenings started getting a bit longer in the spring that we started taking our training seriously. 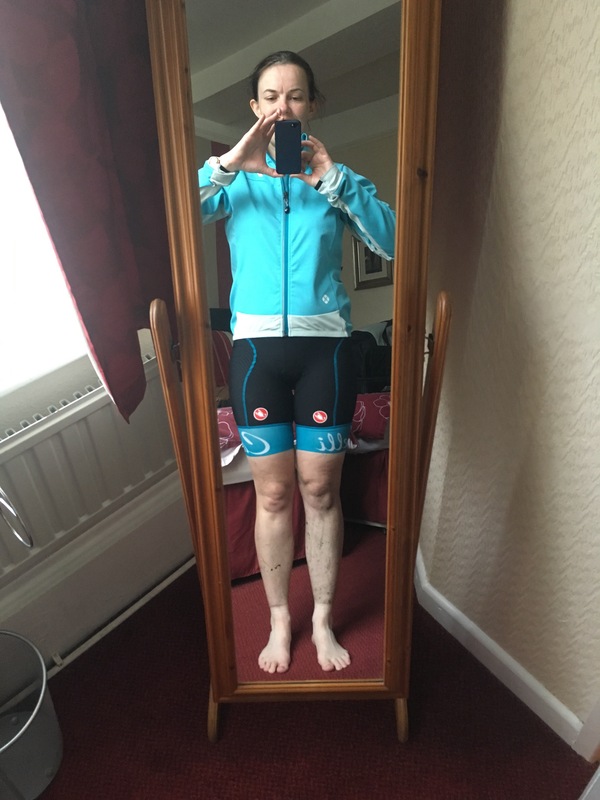 For me, a road bike beginner, it was a massive learning curve. I was petrified of downhills, avoided sharp corners, and after a close encounter with some wet tram lines, anything metal. Looking back, I realise how far I’ve come. 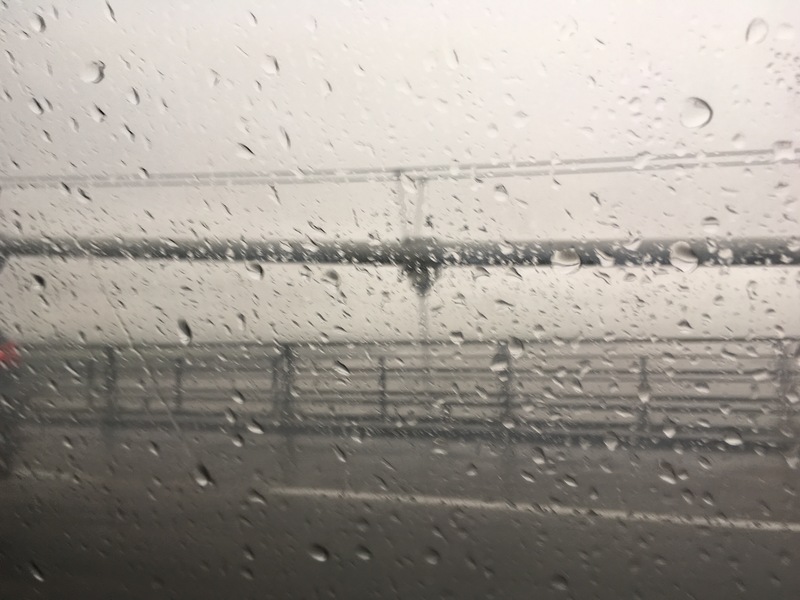 I no longer avoid the steep hills – in fact I prefer uphills to down – corners aren’t a problem and I’ve realised how stupid it was to tackle the tram lines at an angle in a torrential downpour. Training has been a huge commitment and juggling it with everything else has been difficult times. Weekends for the last several months have involved increasingly long bike rides. 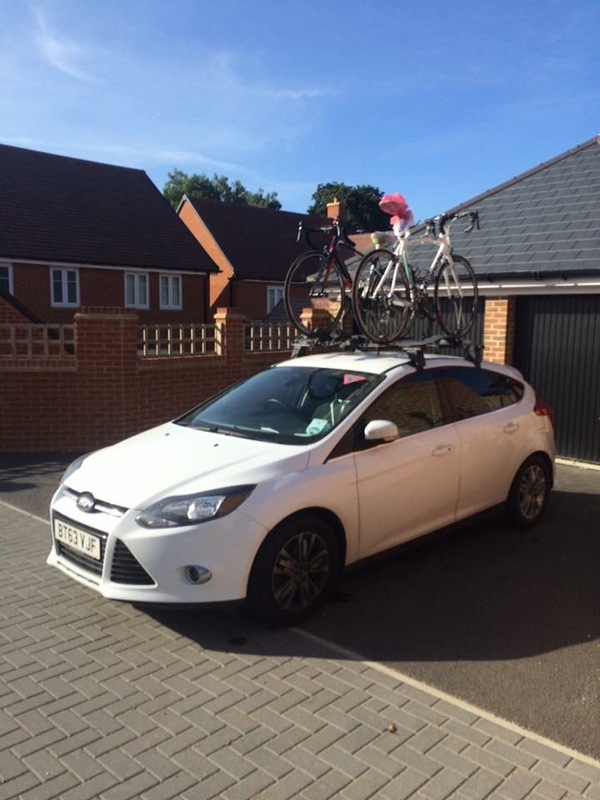 Our definition of what constitutes a ‘long’ bike ride has also changed. For me, I can remember being proud of my first 20-miler. That’s now ‘short’ on the official scale. 70, 80, 90 and 100 mile bike rides all count as ‘long’ or ‘very long’, and the more hills the better! 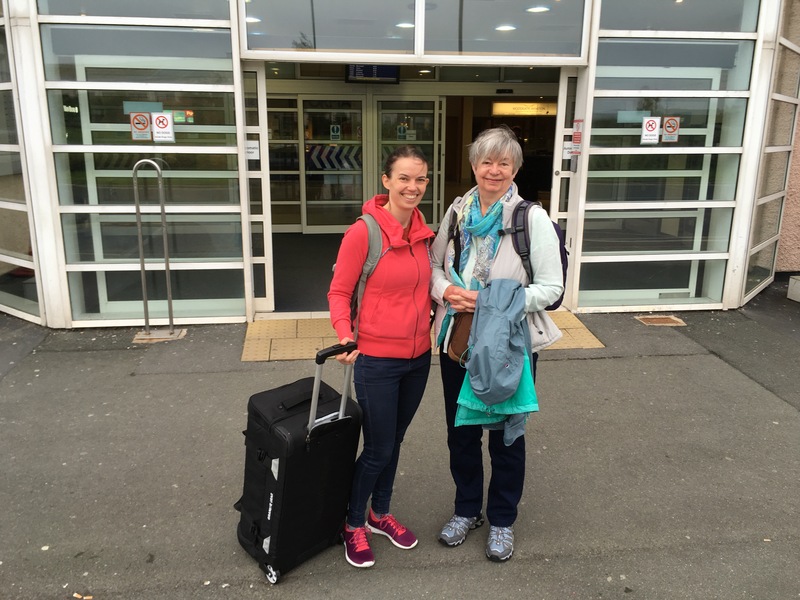 Individually, we could have all gone to Athens (a mere 2,395km) – and carried on. And the keenest cyclist of the three of us (not me!) could have gone to Kuwait City. Liz has made this map of our route that shows where we’re aiming for each day. We have four ‘quite flat’ days that I think we’re all looking forward to. But first of all we have to survive the infamously short sharp hills of Cornwall and Devon. 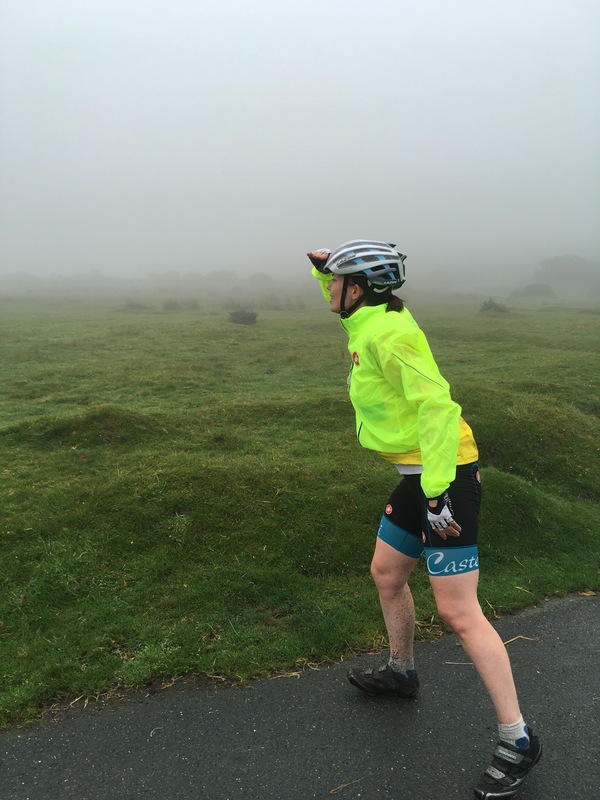 Day seven will be a tough cookie too – 93 very hilly miles anyone?! It shows how far we’ve come with our training though that I can look at the 60-70 mile days and consider them ‘short’. It wasn’t that long ago I was proud of making it 20 miles without collapsing in a sweaty heap. We’re determined to stay together and look out for each other and I know that’s what will get us through the tough times ahead. Liz has the Garmin with the route on it so we haven’t got much of a choice anyway! 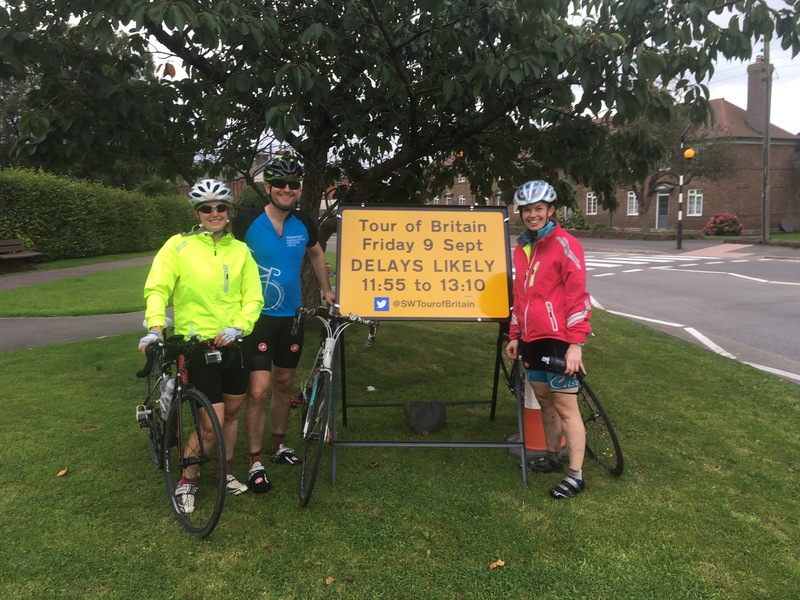 If anyone will be near where we’re cycling and would like to come and say hello, throw some jelly babies to us or even cycle a few miles with us then get in touch. Looking at the map is making me nervous now. Much better to think one day at a time. Today was a big day – our first ride together. 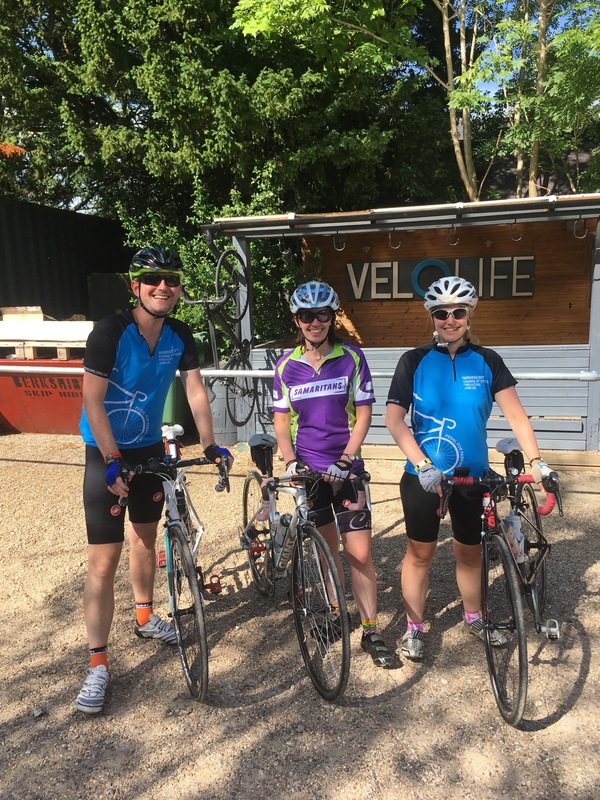 I flew over from the Isle of Man to spend the weekend with Liz and Chris so we could get used to cycling together as a group and to discuss some of the many planning issues. We went out for 83 miles, stopping off in Marlow for lunch and then just 10 miles later for coffee and cake. The picture is taken at the cafe, which we highly recommend! We had a few minor hiccups along the way – ending up in a graveyard, a chain coming off and forgetting the sun cream on what turned into a beautiful sunny day. But all in all, it was great to finally get out all together and we returned home feeling a little more prepared for the adventure ahead. 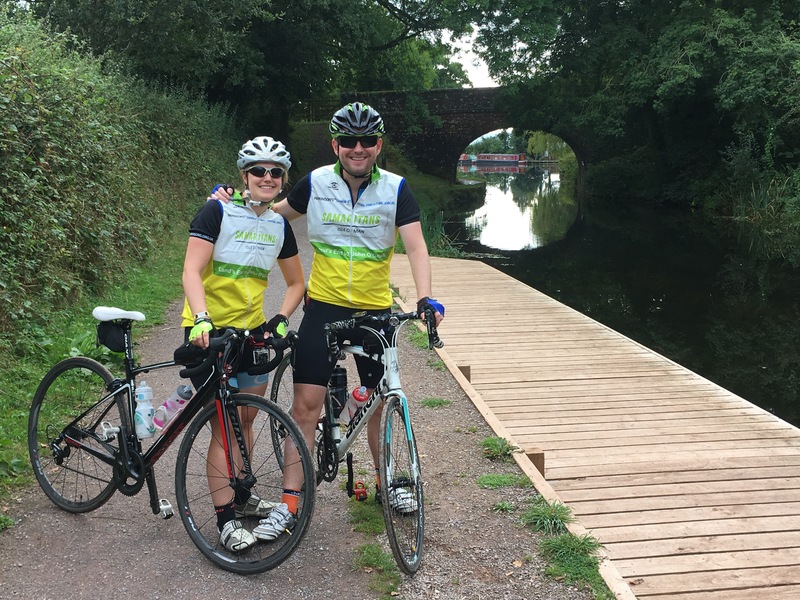 Check out Chris and Liz’s training ride from Sunday. 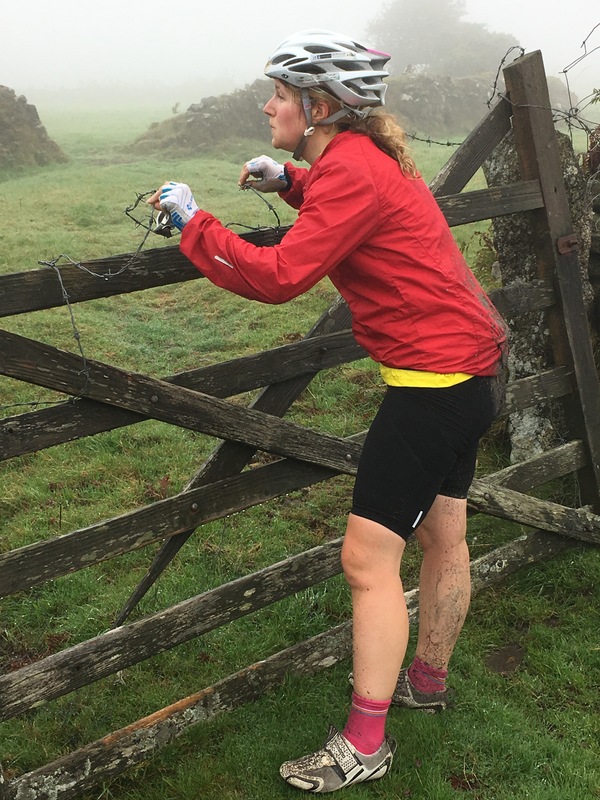 Also please note the eating of a roast dinner in Oxford did not help the following 50 miles.